This is a translation of the classic Disney animated movie Beauty and the Beast. It takes place on a special day at the Beast's dark and remote castle. After years of hopeless frustration, the Beast, formerly a handsome prince, finally has a chance to break the spell that keeps him in his feral state. All he has to do is win the love of the bookish, but beautiful Belle before the last petal falls from an enchanted rose. To enable this blossoming romance to take full bloom, you must play five different games to help Beast's friends prepare a grand ball in Belle's honor. 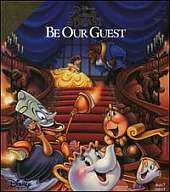 Help Mrs. Potts make cakes, aid Lumiere in practicing his famous Cherry Dance, help Wardrobe sort dyed pieces of cloth as they come off the line, assist Cogsworth in creating a musical score and give Feather Duster a hand as she matches up the right bouquets to decorate the ballroom. It offers two levels of difficulty (easy and adventure) and two modes of play (practice and normal). Activities are designed as animated puzzles and memory challenges with the interface supporting mouse point-and-click input. The game is presented in colorful graphics and animations with a midi soundtrack and is aimed at children.